I’ll go ahead and admit it – when it comes to the Cleveland Indians‘ chances as they prepare for their ALDS match-up with the Houston Astros, I’m nervous. There are a few reasons for this. Some are obvious, like the fact Houston is one of the most complete teams in baseball. Or that we spent an entire season watching the Indians meander their way to what could only be described as an uninspiring division title. However, one of the biggest sources of my concern is Cleveland’s bullpen. A unit which has had an incredibly uneven season, the Tribe’s relief corps could easily make or break the team’s entire postseason. For the better part of the year, the Indians bullpen was a consistent source of fan frustration. Early on, the front office quickly learned the offseason losses of Bryan Shaw and Joe Smith couldn’t be fixed by giving these relievers’ respective innings to Dan Otero, Evan Marshall or whoever Oliver Drake is. When desperation kicked in, the team made a blockbuster move in sending top prospect Francisco Mejia to the San Diego Padres in exchange for All-Star closer Brad Hand and promising rookie Adam Cimber. While this helped calm the waters a bit, the relief unit as a whole still had some uninspiring outings as the season went on. Part of this was a due to the struggles from two of Cleveland’s bullpen staples – Cody Allen and Andrew Miller. The former saw his usage increase as a result of the limited relief options early in the season and has struggled to consistently locate his curve ball ever since. The latter has endured a handful of injures all year long, only recently showing hints he may be returning to form. Bottom line – the relief corps hasn’t been providing the same level of confidence Indians fans have gotten used to over the past couple years. 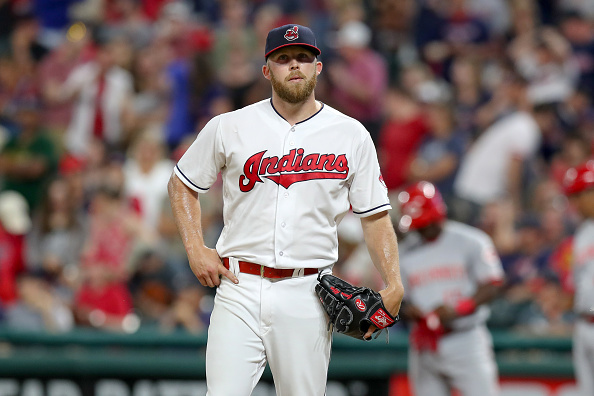 Should one of Cleveland’s starters struggle on the mound in this series, there likely won’t be the same sense of assuredness that the bullpen can pick up the slack. In order for the Indians to get past Houston, they desperately need the relief corps to be at the top of its game. They have significant firepower on offense, as well as one of the best rotations in baseball. However, such advantages can all be undone by way of a bullpen implosion. We saw plenty of examples of this throughout the season from each of Cleveland’s star relievers. Miller was part of a seventh-inning implosion against the Detroit Tigers in July, helping turn an 8-4 lead into a 9-8 loss. Hand just recently gave up a walk-off home run in a loss to the Tampa Bay Rays. As for Allen, when asked to pick which was worse – giving up back-to-back home runs in a ninth inning loss to the Kansas City Royals or his six-run disaster against the Cincinnati Reds – the ensuing rage causes my brain to just shut down entirely. It’s worth noting Cleveland’s three key relievers are relatively trending in the right direction with Game 1 around the corner. Hand has allowed just one earned run since the aforementioned blown save against Tampa. Miller appeared to be back in All-Star form before a rough outing during the final series of the season. The same could be said for Allen, who, before giving up six earned over the weekend, hadn’t allowed an earned run since late August. Sure, each of those positive spins included a concerning caveat. Still, compared to what we saw earlier in the year, this is considered progress. At least, that’s what the Indians are hoping. They know how far they can go if their bullpen is locked in. They also know how badly struggling relievers can impede your chances. On paper, having a bullpen featuring three All-Stars seems like a perfect postseason scenario. The problem, though, has been how infrequently the relief corps has succeeded this year despite that. Should Miller, Hand, Allen and the rest of the relievers get their act together and prove more than reliable, Cleveland could be a threat to go on a deep postseason run. If they don’t, it could lead to another October which ends far too quickly.